to make the settings easier. It connects to any available scanner input in the system, and works like typical keyboard scanner, meaning it plays notes when not in edit mode. All MIDI setup possible in MIDI boards available in this website is based on numbers. The manual describes all possible settings as sequences of digits that user has to enter. 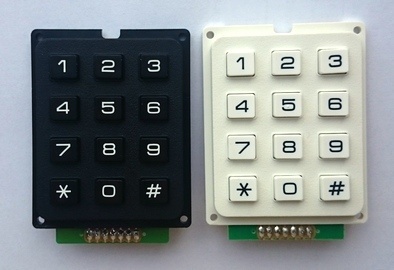 Although it is possible to do it with 10 lowest keys of any keyboard connected, it becomes much more easier when this little black keypad is available. Button "#" works the same like the EDIT button connected to 2-pin header present in MRG2, MRG3 and MIDI128 boards, or last input of MBBS controller. at the back of it there is entry for rotary encoder, simetimes called endless potentiometer. It is treated as additional potentiometer in the system, and can be set to all events available for other inputs, for example you can make this way nice Program Change dial. enter MIDI parameter value by numbers in the "value mode"